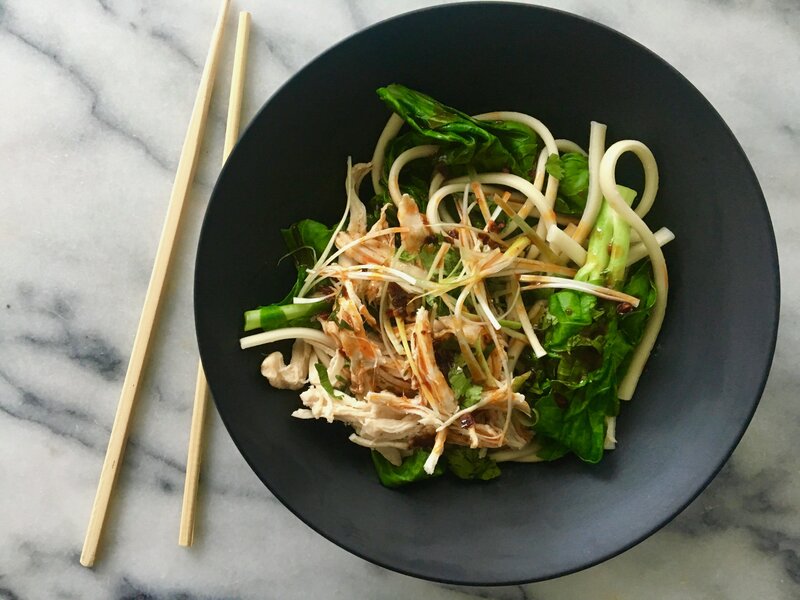 Here’s a light and flavorful noodle salad that is enthusiastically endorsed by my two young noodle slurpers: chewy udon noodles, crunchy gai lan (or your favorite green veg), and shredded rotisserie chicken all tossed in a tasty soy-mustard-sesame dressing, with just a kick of chili ;). In addition to being a hit with the family, it’s also a total breeze to put together. Enlist extra hands to shred the chicken and measure the dressing ingredients into a jar (just shake dressing to combine). Then all that’s left to do is blanch the green veggies, then cook the noodles in the same pot of already hot water. Toss it all up and enjoy! You could go the extra mile and garnish with minced scallions and herbs, crispy shallots or even a fried egg if you are looking of something a little more hearty. Try it warm or cold. It’s a favorite for portable summer picnicking adventures, too! I’m kind of obsessed with this chili condiment lately (known to many as “happy lady sauce”), so I recommend throwing some on too in generous amounts. There’s an interesting article about it here as well as the story of Tao Huabi (the “happy?” lady pictured on the bottle, aka “the godmother”) an illiterate, widowed mother who gained popularity for the chili sauce she made for her noodle shop and later became a chili sauce mogul of sorts.